Ever wish you could be on the game show “Wipe out” or “Most Extreme Elimination Challenge”? 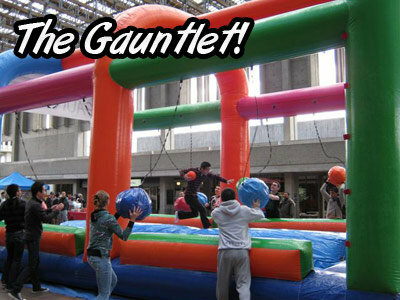 Here is your chance, The Gauntlet is here! One person at a time will run on top of the center wall and try to score a basket at the end of the unit with a nerf basketball. In the meantime, 10 other people are hurling the padded tethered balls trying to knock you off! This game is great for large groups as it occupies 11 people at a time.